WAS a Very Fun Exercise Machine! The last time we visited the Yowza headquarters in Fort Myers, Florida, we had a great experience. Being personally greeted by the former CEO Marc and meeting the core customer service support group allowed the team to really get to know what makes Yowza tick. However, things have changed a great deal since that visit, with staff leaving, and management changing. Things aren’t quite what they used to be and we’ve been disappointed so far. NOTE: We’d recommend the Smart Strider 895CSE from ProForm. It’s another great rear drive machine from a company with a solid reputation..
You may be asking “who the heck is Yowza?”. The Yowza brand has been around a few years but the parent company is Greenmaster which owns and build Yowza products. Greenmaster has been in business for over 30 years and ships fitness equipment to over 47 countries. Greenmaster is known as building quality equipment with an impressive service record. Note: There are two models, the Navarre Plus and Navarre Elite. The main difference is in the grab handles and the Elite version has motivational weight management technology. Plus the Elite carries a 7 year parts warranty in comparison to 5 years on the Plus model. Both come with Yowza standard lifetime frame and 2 years in home labor. Rear Drive Design — This seems to be a controversial subject as to which is better, front drive or rear drive? Front drive machines normally rely on a rail system and rollers to stabilize the machine and support your body weight. Rear drive machines were the original design of ellipticals but covered by patents which is why many companies designed a front drive. Either style if designed properly offers a great workout although some consider the rear drive to better center your body and the pattern to be a more natural gait. Variable Stride Length — The stride length actually changes when you change the incline. Both Navarre models range from 19″ to 30″ stride length with a 60% incline. This allows you to target different upper and lower body muscles between work outs. In addition, you can work out in a forward pattern or reverse pattern to target even more muscles. For tall people the 19″ stride may be limiting but 25″ to 30″ seems to be a very comfortable range. Self Pivoting Pedals with Soft Gel Insert — If you work out on an elliptical very long you may experience “toe sleep”. It’s a common complaint and occurs from the repetitive pattern and constant pressure on your toes. It varies with each machine and of course the angle of the pedal, the incline and other factors determine the severity. Yowza has a simple solution to the problem and developed a pivoting pedal which helps eliminate toe sleep. Sounds simple enough and we aren’t sure why every company doesn’t follow, but add that to your “check box” as a huge benefit for Yowza. They even put in a Soft Gel insert on each pedal which is much more comfortable than standing on hard plastic. Electromagnetic Friction Control System (referred to as “Eddy Current)” — This is an expensive technology on your new Yowza but well worth the investment. The electro-magnetic braking system is super quiet, no jerking or uneven motion and is even being used in commercial environments which speaks to the durability. Multi-Grip Handlebars (Elite Model Only) — The multi-grip handle bars allow you to target different arm muscles. Sealed Bearings — Most manufacturers use bushings rather than bearings for three reasons. They cost less, to save money, and they cost less. Yowza uses bearings rather than bushings for three reasons: Quieter, more durable so they last longer, makes for a happy customer. Speakers & MP3 Input — Most ellipticals have some sort of audio input and decent sound. The quality of the speakers on the Navarre seem to at least up to industry standard and perhaps slightly higher. The blue tooth is a nice feature which eliminates wires so you don’t have to worry about accidentally ripping the wire from your listening device (meaning your $500 smart phone). Too often we see ear buds pulled from ears while exercising or expensive smart phones accidentally broken. Wireless is the way to go! 3-Speed Fan — Another feature found on most ellipticals. Because you can increase the fan speed it is better than most, but you will not get blown away. 307 lbs. 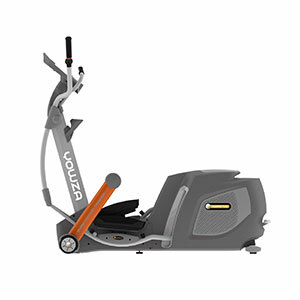 Unit Weight — The heavy weight guarantees the Yowza Navarre elliptical will be very stable and can handle heavier users up to the maximum rated weight of 400 lbs. You may want to opt for the inside delivery option because of the weight. Warranty — The Plus is 5 years and the Elite is 7 years, both signifying the quality of the components and confidence from the manufacturer. Both models include lifetime warranties on the frame and Eddy Current braking system as well as 2 years In home labor–wow, talk about service! The Navarre Pilot is almost identical to the Navarre Plus, but has a different, less expensive, resistance system and does not have the Intelligent Weight Management scale or programming. Given the recent changes in Yowza’s company, we’d recommend the Smart Strider 895CSE from ProForm. It’s another great rear drive machine from a company with a solid reputation.